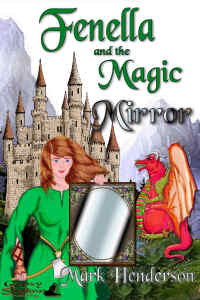 Buy Fenella and the Magic Mirror! Fenella is officially a damsel, but she’s the despair of her parents, who want to marry her to young Sir Mallicose. Big, muscular, dark, scruffy and bold, Fenella would rather chop logs and shoot arrows than embroider a tapestry, and she isn’t interested in Sir Mallicose at all. Her younger sister Felicity—delicate, pretty, shy and retiring—loves embroidery, loves Sir Mallicose, and hates Fenella. When the terrible dragon Faffer arrives in the neighborhood, wreaking havoc and stealing livestock and maidservants, Sir Mallicose goes to fight him—and is captured. Fenella sets off to rescue him, despite the fears of her friend Harold the Steward. Her only weapons against Faffer the dragon are her axe . . . and her magic mirror, which shows you the thing you most greatly fear. Will they be enough? And if Sir Mallicose is rescued, which sister will he marry?